You&apos;re probably asking yourself, why is tennis any different in wine country? The Central Coast has a variety of great tennis venues and public facilities, and then, of course there is the weather – much of the year, the skies are blue, the weather is beautiful making it the perfect environment for playing! 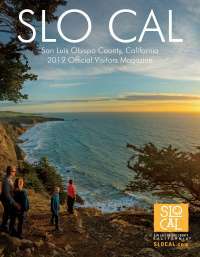 SLO CAL boasts several clubs that excel in tennis: Avila Bay Club, Paso Robles Sports Club, San Luis Obispo Country Club and the newest club, Templeton Tennis Ranch. While all of these clubs are close to wineries, Templeton Tennis Ranch is fortunate enough to be smack-dab in the middle – close to Highway 101 and Highway 46 West. Visitors should be aware that temperatures inland can heat up in the summer – so the strategy is to get on the courts early to mid-morning and finish up by noon. Have a shower, enjoy a nice lunch, then hit the wine trail – you’ve earned it! In the Templeton Gap area, there is usually a pleasant breeze in the early evening that makes those summer evenings ideal for outdoor play – usually 75 or so degrees – so evening outdoor activities are also a treasure. Tennis is truly the life-long sport. 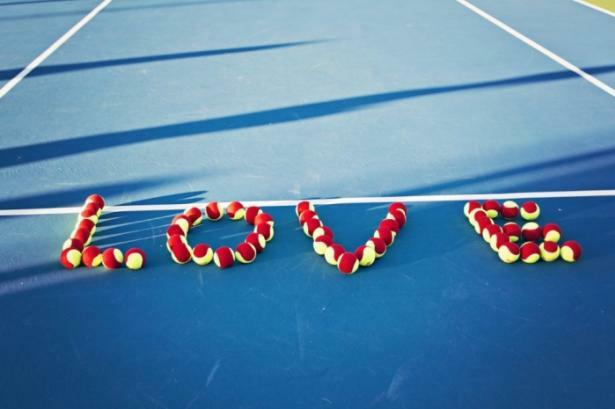 An hour of singles burns 580 to 870 calories and 3 hours per week of tennis reduces heart disease by 56% according to recent studies! Wow, that’s awesome! Tennis develops strong hand-eye coordination, reduces stress and improves alertness and tactical thinking. The social benefits are also strong: the whole family can enjoy the sport together while organized play builds teamwork and sportsmanship and improves communication. With tennis, there are always people to play with – locals enjoy playing with visitors and visitors can learn some of the inside secrets in the area. Several wine makers are also tennis players – so you might just get invited to a private tasting! After that physical exertion, your body will enjoy sipping on wine after some competitive or casual play. The tremendous choices of wineries and the many varieties of wines make exploring the Central Coast a true joy. Bocce is also a popular game throughout the region – and we all know bocce is best with WINE! The newest sports highlight in San Luis Obispo County is the Central Coast Pro Tennis Open. This is a $60,000 Women’s USTA Pro Circuit event to be held at Templeton Tennis Ranch from September 24 through October 1, 2017 (and annually thereafter). This is the newest pro circuit event on the USTA calendar and the first time professional tennis will grace the Central Coast and SLO CAL. Templeton Tennis Ranch jumped right in when the opportunity became available to be a host facility for this prestigious event – the primary goal was to encourage more tennis awareness and play in the region. The tournament will consist of 74 tennis matches played over the eight day period. Over 80 professional women tennis players from over twenty countries will compete for the prize money and very valuable WTA ranking points. Players will be ranked from about 100 to 400 in the world. This is world-class tennis up close – and yes, there is a vineyard in the viewing background. Attending the event is a must for every tennis enthusiast and will be very exciting even if tennis isn’t your main thing. The venue is planning wine tastings during the week on select days – so you don’t need to feel rushed to leave the tennis action. The cost is FREE – until the semi-final matches, and even then the cost is a mere $10/pp. So when you are planning to visit SLO CAL for wine tasting, shopping, beaching, hiking, exploring or whatever, toss your tennis racquet into the car, call a local club and get some quality tennis in! 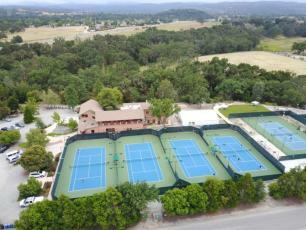 Templeton Tennis Ranch welcomes visitors and can usually arrange match ups with a few days’ notice. See you on the courts – and in the tasting rooms! For more information on the Central Coast Pro Tennis Open visit www.ttrprotennis.com or just www.ttrtennis.com or 805-434-9605 to connect with Templeton Tennis Ranch.